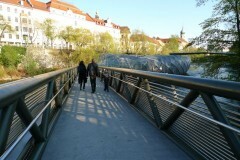 Graz was the capital of culture in 2003. It’s a vibrant youthful city with 5 universities the first university was founded in 1585. I have been told that Shrodingoer, Tessla and Keppler studied here. The city is divided by the river Mur and in 2003 as part of the program for city of culture Vito Acconci design an island which in a shape of a shell connected by curved bridges. 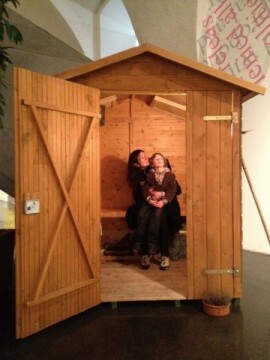 The structure houses an indoor and outdoor café which doubles as a performance place. The island lights up at night-time with a blue glow. 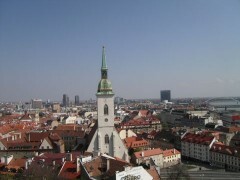 The town is build around the hill with Schlossberg castle on the top and the Uhrturm clock. 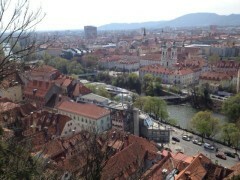 Actually the whole city is full of clock towers and the sound on the top of the hill at midday is a sonic treat. Listening to the city at 12 and the sounds of the bells coming from all the directions at different levels and tunes made me realised that I should have all of my locations play at 12 in dialogue with each other. This will require some tests at the mixing stage. 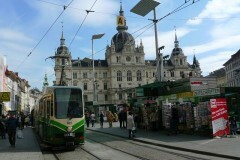 It is always sad to say good-bye to Vienna it’s a truly great, dynamic city. Yesterday’s recordings went well despite the weather, from 20 C in Bratislava to 5 C in Vienna and feeling colder with wind chill and light snow. I have recorded the chimes of the bells of the Maria am Gestade, a gothic church which was the favoured by the sailors that worked on the Danube. Running thought the town I just managed to capture the 3pm chimes of the Alte Hofburg clock too. 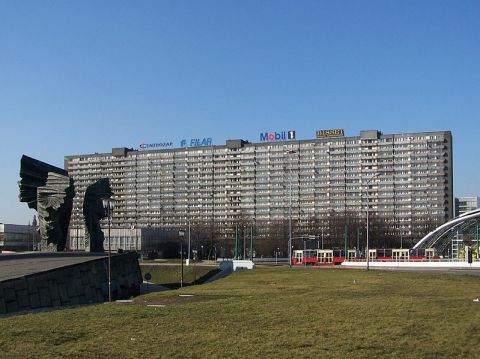 I have also recorded the ambient sounds of the Judenplaz; a town square in Vienna’s Innere Stadt where the Jewish community was located prior to the Second World War. 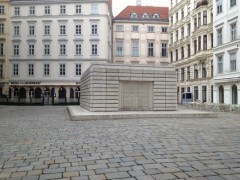 Rachel Whiteread’s monument to Austria’s holocaust victims is in the northwest part of the square. The walls of the memorial resemble the walls of a domestic library room which could be a cast of one of the rooms of the apartments from the square. The books are turned with their spines facing inwards. 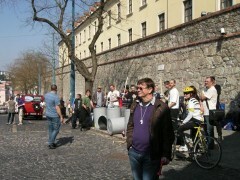 On the concrete plinth there are carved the 41 names of death camps to which the Austrian Jews were deported. 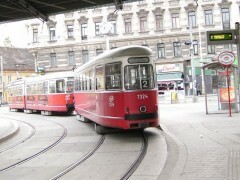 I couldn’t stop myself from recording the journey on the tram back to our apartment on Yeppenplaz, particularly as it was one of those vintage narrow trams that creak, groan and rattle their way around the Viennese side streets. Today travel from Meidling station gave me an opportunity to record the announcements from this railway station. Wow! The train between Vienna and Graz travels along the Semmering Rail line, UNESCO world heritage track through the most beautiful alpine countryside; we are very high in the mountains on a winding train track with lots of high level viaducts and tunnels with many of the peaks covered in snow. My ears are popping as I type…. 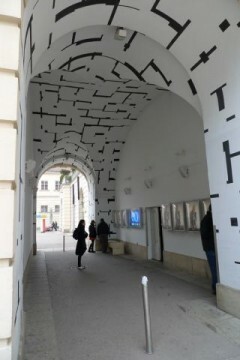 Arrived in Vienna, started my visit by meeting with the curator of the Tonspur project www.tonspur.at Georg Weckwerth in the Museum Quartier – MQ www.mqw.at. Georg showed me around his new exhibition co-curetted with Jozef Cseres “Membra Disjecta for John Cage – Wanting to Say Something About John” (on from 17.2-6.5.2012), an important show focusing on John Cage’s influence and inspiration on contemporary art in the year of what would have been his 100th birthday. http://johncage.tonspur.at/ The show features contributions from over international 60 artists whose work has been influenced by Cage and also features original work by Cage himself including ‘Not Wanting to Say Anything About Marcel’ eight screenprinted plexigrams created as a visual homage to Marcel Duchamp. My favourite piece was an experimental documentary by Sabine Groshup focusing on the Halberstadt organ project, a 639 year performance of Cage’s ASLSP (As SLow aS Possible) which started playing on a specially constructed pipe organ in 2001 and is due to complete in 2640. The sound quality of this documentary (on headphones) was amazing. If you’re interested in hearing where the ASLSP performance of the piece is up to then listen to it here (www.aslsp.org) you never know you might just catch a change of chord. 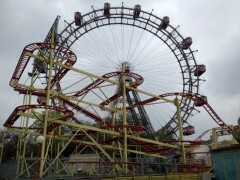 Also in Vienna I’ve been out and about with my collection of microphones and digital recorders, capturing the ambience of a number of interesting Viennese environments, including; a farmers market at Yppenmarkt ; Westbanhof station and the Prater amusement park (where my husband got to fulfil a long standing ambition and ride the Wiener Riesenrad (big wheel) featured in the film the Third Man, he’s been humming the tune ever since and now I can’t get it out of my head. Yesterday, my last day in Bratislava started with a minor problem with my binaural microphones; the very rare battery in the microphones stopped working. 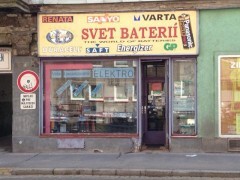 After searching the electrical shops through out the city somebody directed me to “Svet Baterii” (The world of battery) amazing little shop with all the batteries you could ever need. Amazing!!! I highly recommend them if you are ever in Bratislava and need a rare battery. 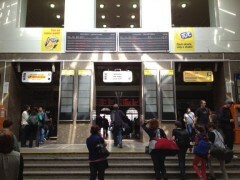 So, after all the morning stress I was able to record the 1 – 2 pm hour for my clock at Bratislava station. 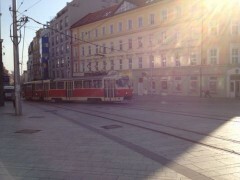 I have also captured great sounds of the Bratislava trams. I am starting to visualise the multi track with overlaying sounds. 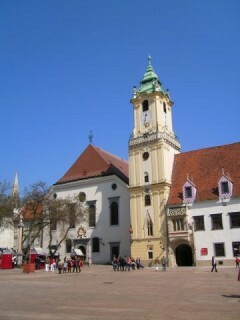 Today we are in the old town of Bratislava “Stare Mesto”. 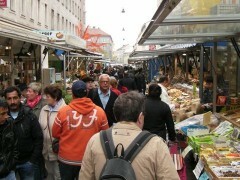 The town has been strongly influenced by different nations such as Slovaks, Hungarians, Austrians and the Jewish population. During the 16th C to 18th C it was the capital of Kingdom of Hungary. 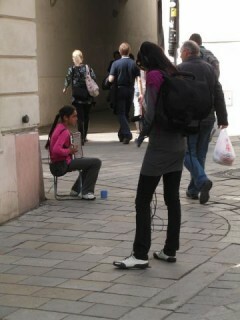 I have made the recordings next to the St Martin Cathedral and Hlavné Námestie – the main square in old town. To spice up the recording of the old town we managed to capture the sounds of “Protest Gorila ” at the gate to the castle. The protesters were using plastic containers as drums, whistling – very impressive. 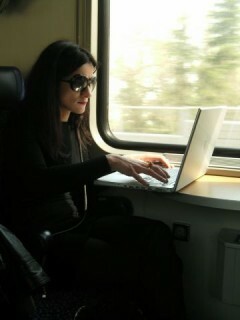 Tomorrow I am planning more recording in the modern part of town before the departure to Vienna.